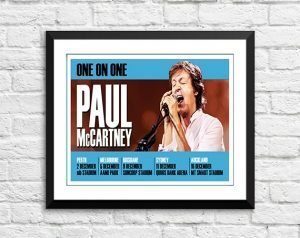 Classic Paul McCartney Band Concert Posters and Memorabilia! Buy Online Now! Out of all the former Beatles, Paul McCartney by far had the most successful solo career, maintaining a constant presence in the British and American charts during the ’70s and ’80s. In America alone, he had nine number one singles and seven number one albums during the first 12 years of his solo career, and in his native United Kingdom, his record was nearly as impressive. McCartney‘s hot streak began in 1970, when he became the first Beatle to leave the group. A little more than a year after the Beatles‘ breakup, McCartney formed Wingswith his wife Linda and Moody Blues guitarist Denny Laine, and the group remained active for the next ten years, racking up a string of hit albums, singles, and tours in the meantime. Wings disbanded in 1980 but McCartneystayed near the top of the charts over the next five years, thanks in part to a couple big duets with Michael Jackson. McCartney revived his solo career in 1989 via Flowers in the Dirt and its accompanying international tour, setting a template he would follow into the new millennium, when he’d support his records by playing concerts around the world. Between these massive endeavors, McCartney pursued other projects, including classical compositions, an electronica outfit with Youthcalled the Fireman, and overseeing archival projects such as the Beatles‘ Anthology series. As the 21st century rolled on, McCartney continued to take risks, including recording an album of standards from the Great American Songbook and collaborating with rapper Kanye West, proving that there was no area of popular music he couldn’t touch. 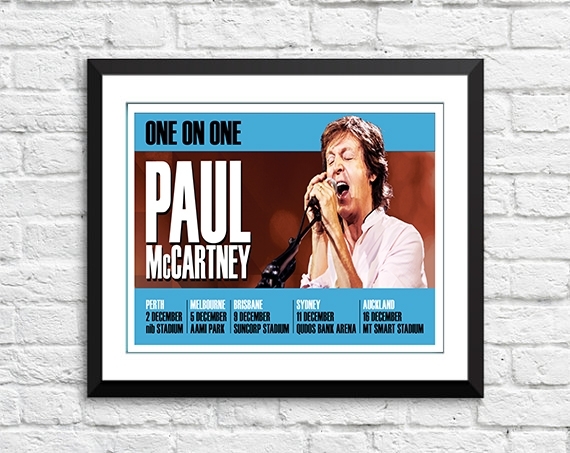 We stock some awesome Paul McCartney Band Concert Posters.